Those who are on a tight budget, but still want to get an HDTV, will have to make some compromises. The case before was that you had to give up both features and picture quality. However, now this TV is one of the most amazing 1080p Smart TV options you can get your eyes on while waiting for prices of high-end, 4K TVs to drop. On the majority of budget TVs you most likely won’t get the best picture quality without spending considerable amount of money. However, thanks to Roku TV, you are now able to have affordable, but full-featured big TV without having to break your bank. This model is not only Roku ready, but a real “Roku TV” boasting Roku’s interface and online features directly on its screen. This means the Roku Streaming Stick doesn’t take up the vital HDMI port on the TV. Not just that, the whole experience with this TV is much smoother this way. 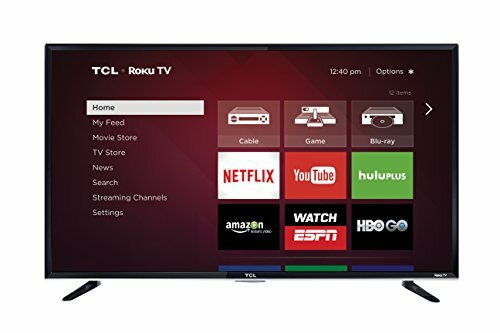 The TCL 50FS3800 shows that Roku and TCL are doing an amazing job and producing amazing, compelling budget HDTV. Although the picture on this screen probably won’t wow you, at around $400 for a 50-incher filled with Roku’s vast selection of media features and content channels, the bargain that this TV presents will. If you are in the market for a big screen with built-in YouTube, Hulu, Netflix, and other features for an affordable price, this TV should probably be at the top of your list. However, if you need a high-quality, top-notch picture, you should be ready to spend much more. Picture quality on this TV, including color, contrast, and blacks is not its standout feature. Whilst the brightness it produces is pretty impressive, black levels suffer and turn more bluish black occasionally. From side angles (at around 15 degrees off center) color saturation and contrast degrade notably. Moreover, the motion blur is really rarely visible, but judder is present because of the fact that the TV doesn’t have refresh rate smoothing features. Input lag on this model is higher than with most TVs on the market, therefore it might not be the best television to choose for gaming. Still, if you plan to play games on this screen, set TV Brightness to Brighter, also set to Game Mode On, dial back the brightness, contrast, and backlight, and set color temp to Cool or Normal. All of this may sound pretty bad, but the picture is actually really good for the price. After all, you are not spending that much money to get a superior color performance or panel on the TCL 50FS3800. Roku is an amazing Smart TV platform; many would agree the best on the market. If you give this some more thought, you’ll realize that you’d normally spend around $100 for the Roku 3 Box, but this TV contains Roku’s Smart TV platform, so you will get the same performance, and save some money with this TV. The home screen, after initial setup, will appear with the amazing and easy search function, with the big App boxes, the Settings, and the Channel store. Roku’s search function is most likely the best of any Smart TV. Its selection of apps is also the best out there with around 1800 apps available. Of course, many of them are pretty useless, but all the most-used, best apps are included such as Amazon Instant, Netflix, Hulu Plus, Vudu, HBO Go, RedBox Instant, Crackle, and much more.